Image Credits: Harvest Seasonal Kitchen, Franconia Brewing Co. Earlier this year, Harvest Seasonal Kitchen announced its intention to begin brewing beer in house at its location in McKinney. Since then, the restaurant has introduced a few limited offerings, but an upcoming event will give patrons a chance to experience how Harvest's craft beer vision is coming into focus. Working together with Dennis Wehrmann and his nearby Franconia Brewing Co., Harvest will host its first ever beer dinner on Thursday, September 21. The evening will begin with appetizers and opening remarks at Franconia's facility, with festivities shifting to Harvest after that for the presentation of a six-course menu. "Dennis and I sat down when we obtained our brewpub license and talked about ways the two of us could work together," says Toby Thomason, general manager of Harvest. "I wanted to do a nice, charity event, but also something that was educational. What we decided to do was to take inspiration from what Dennis does well, and then shake things up to show people how differences are introduced." In addition to a number of brews created exclusively by Harvest, the list of beers expected to be served at the dinner includes Franconia's popular Triple Dunkel, and its seasonal Oktoberfest. The featured fermentation, however, will be a beer created by way of a collaboration between the two companies. "We brewed a spelt beer at Franconia with Dennis that uses local honey and base grain from TexMalt in Fort Worth," explains Thomason. "It's a beer that uses locally-sourced ingredients with some German heirloom wheat, so that kind of ties in our two concepts really well. The beer pays tribute to the brewing heritage Dennis brings, and also to our passion for local farmers and the local farming community - which is the whole reason we decided to get into brewing to begin with." Franconia dabbled with spelt in a beer early in its history, but Wehrmann went with a different approach this time around. "It's similar to the spelt beer we made before, except we changed the yeast and used grain from TexMalt," says Wehrmann. "And there's honey in it, which is something that wasn't in the original. That first spelt beer was brewed with a 100% German approach, but this one is done more in the American way." Left: Honey Spelt is made with Ireks spelt malt and honey from N&P Farm & Dairy in Farmersville. Cascade hops providing the punch in a pale ale designed for the event (click to enlarge). The result, Wehrmann believes, is a beer with a flavor profile that should fit right in with the coming shift in seasons. "I think it tastes like fall," states Wehrmann. "The beer is a little sweet upfront with a hint of honey, but it finishes dry. It's really earthy, with a lot of really, ripe apples in the beginning. To me, the aroma is like that of a bunch of apples sitting in a wooden box at grandma's house." Of course, the use of honey goes against Franconia's tradition of brewing to the Reinheitsgebot, which allows only for the use of water, hops, malt and yeast in the production of beer. But, that's one of the ways the differences Thomason wants to showcase come into play. Another way can be seen in a series of altbiers he's working on for the event. "We did a base altbier where we tried to emulate some of the processes Dennis would use," says Thomason. "Then we brewed two more batches and did things to change them up. We added local blackberries to one, and aged another in a Balcones Baby Blue barrel. Neither gets too crazy, but the changes are just enough to show you what differences there can be in the beer." Something else Harvest will highlight during the dinner is the progress its made towards a goal of producing a beer using all Texas ingredients. "We've developed a couple of different yeast strains on our farm," says Thomason. "One was propagated from the blackberries used in the altbier, so we fermented that beer with a mix of the culture from the fruit and our brewer's yeast. The other strain comes from our wildflowers. We're using that one in a pale ale we're doing, which will also incorporate the first crop of Cascade hops yielded from the farm. So, really, the pale ale will be our first truly Texas beer." As for the event itself, tickets are on sale now at a cost of $125 per person and quantities are extremely limited (click here to see the menu and purchase tickets). It should be noted, though, that all proceeds will be donated to charity. "The entire ticket price is going to The Seed Project Foundation," says Thomason. "It's a company that we started to assist groups that promote sustainability and community. This year we're supporting Community Garden Kitchen, an organization that serves meals to food insecure families in Collin County." In addition, the collaboration beer - simply called Honey Spelt, will remain available after the close of the dinner for a limited time at both Harvest and Rick's Chophouse (the two entities share the same ownership). Revenues from the sale of the beer will also benefit The Seed Project. In her new book, Session Beers: Brewing for Flavor and Balance, author Jennifer Talley points out that session beers have been brewed for hundreds of years. In other words, session beers are not a trend. It may seem that way given the recent uptick in popularity of these types of beers, but even the term "session beer" pre-dates all of the modern mega beer madness. You know, back before the bugs, the barrels and all things high-ABV took hold of everyone's senses. Of course, history lessons are just a jumping off point into a subject, not mention a beer type, that has much more depth than the "session beer" moniker might imply. Indeed, session beers aren't just about lower alcohol content. Things like bitterness, body, carbonation, finish and sweetness can also impact a beer's drinkability. It's up to the brewer to find the right balance of these and other factors in creating a beer that keeps you coming back for more. And, Talley would know just how to do that, considering she spent over 20 years brewing in Utah, where state-imposed restrictions require beer to contain to less than 4% ABV. It's that experience Talley brings to bear in Session Beers, where she discusses not only the definition and design of session beers, but also how best to go about drinking them. Naturally, there are an abundance of recipes as well (nearly half of the book is devoted to them), with breakdowns provided for both commercial (in the form of an outline) and five-gallon batches. Recipes appear for popular beers from the likes of Bell's, Firestone Walker, Stone and others. There's even one from Lone Star State, with guidelines given on how to make Saint Arnold Fancy Lawnmower Ale. 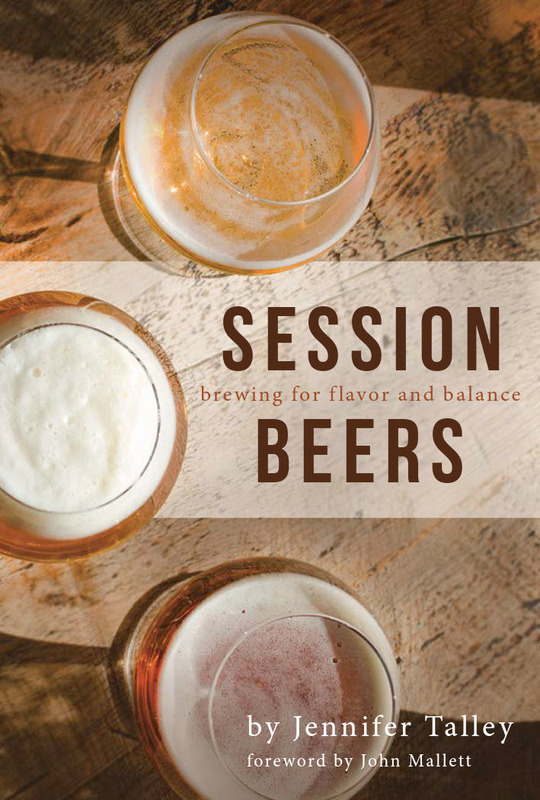 The recurring theme throughout, though, centers on the idea that a session beer should be a beer that encourages extended enjoyment. Talley explains that such a thing is good for the consumer in that it allows for more time with friends, while also helping in the area of responsible drinking. Not surprisingly, the increased consumption is good for business owners as well, and Talley takes the time to show how offering session beers to patrons can be a boost to the bottom line. Session Beers is published by Brewers Publications (pre-release copy provided for review). It is available now, exclusively to members of the Brewers Association and the American Homebrewers Association. Public sales of the book will begin on August 31. There's a new temptation on the North Texas scene, as Lakewood Brewing Co. of Garland has added a new beer to its Seduction Series. 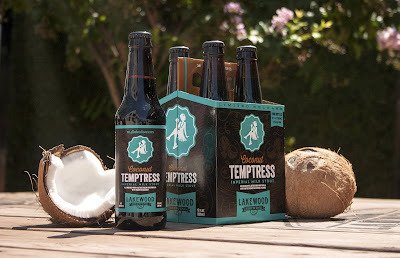 Coconut Temptress is the fifth entry in the Seduction line, which features different takes on Lakewood's year-round imperial milk stout, The Temptress. “We’re excited to release this new variant in the Seduction Series lineup,” says Wim Bens, founder of the brewery. “We’re always looking for ways to keep the Seduction Series fresh, while incorporating enticing flavors that people want." 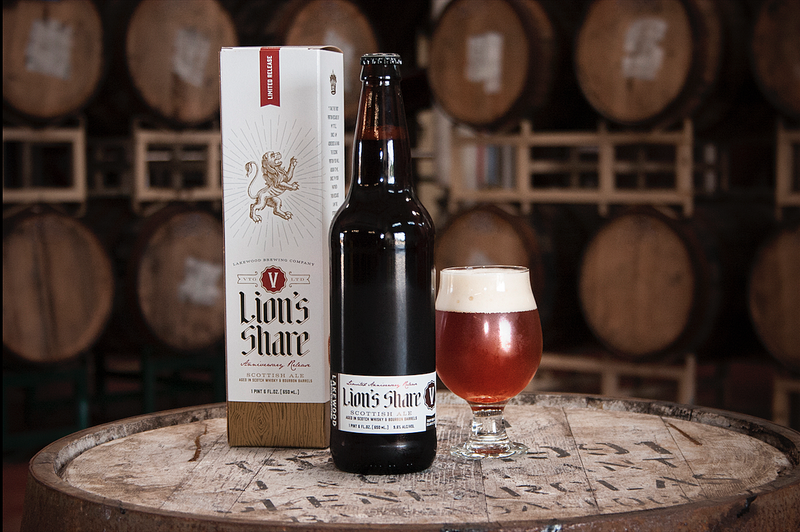 The new beer is infused with the equivalent over five pounds of toasted coconut per barrel. The flavor addition blends with the base beer to provide a rich hint of coconut on top of the delectable, chocolate notes that Temptress fans love. Look for Coconut Temptress on tap and in four-packs of 12-ounce bottles. Now midway through its third year in business, Texas Ale Project of Dallas has announced a two-pronged expansion that includes supplying a variety of new retailers across the Lone Star State, as well as the delivery of its products to the City of Tyler. According to a press release, the brewery's sales are up over 45% compared to last year, giving Texas Ale Project the capability to increase its distribution footprint to a total of 64 counties in Texas. Texas Ale Project recently began shipments to Tom Thumb and Albertson's locations in the Dallas-Fort Worth Metroplex. With this latest move, though, fans of the brewery can expect to find its beers throughout Texas at retailers like Fresh by Brookshire's, Lowe's Markets and Doc's Liquors. In addition, Sam's Club locations in North Texas, Wichita Falls and San Angelo are now carrying six-packs of Texas Ale Project's flagship beers, Fire Ant Funeral Amber Ale and 50 FT Jackrabbit IPA. Consumers can also look for a new variety case, featuring a mix of Fire Ant Funeral and one of the brewery's rotating brews, at the Costco on 8055 Churchill Way in Dallas. Purchase Oak Highlands Oktoberfest and drink craft beer for a cause (Oak Highlands Brewery). Oak Highlands Brewery of Dallas has announced a new partnership with the AiRS Foundation to help raise funds for breast cancer survivors. The AiRS Foundation is a group dedicated to assisting women with the costs associated with restorative breast surgery, while connecting them with doctors that can help. Beginning August 1, and running through October 31, Oak Highlands will supplement this effort by donating 10% of all sales of its Oktoberfest beer to the cause. 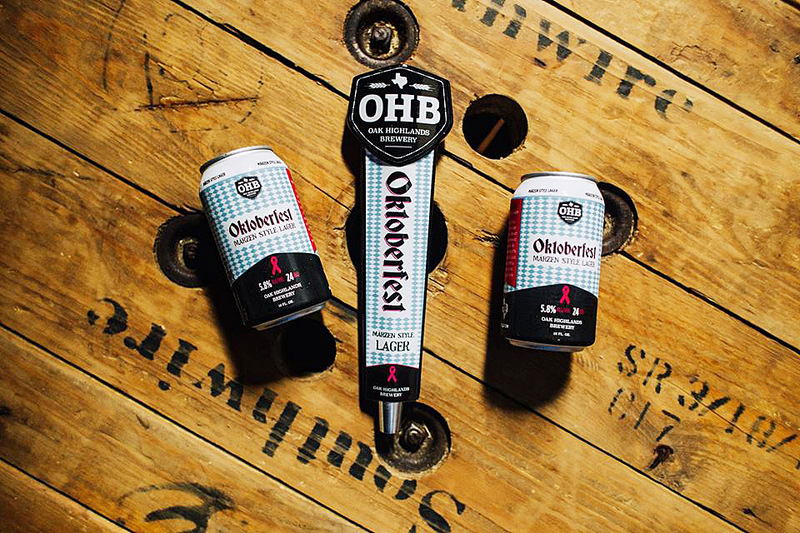 “Oak Highlands Brewery gives 10% of the proceeds from the sales of its Oktoberfest beer to a different local breast cancer awareness charity every year," says Erica Connolly, marketing director at Oak Highlands. "Breast cancer has touched many lives, including those closely connected with Oak Highlands Brewery, and because the traditional Oktoberfest season and Breast Cancer Awareness Month loosely coincide, we thought it was a perfect opportunity to raise awareness and money to help find a cure." Women who have undergone a mastectomy are often unaware of their options for reconstructive surgery, which is a key part of the physical and emotional healing for breast cancer survivors. It is estimated that 70% of women do not have options discussed with them or they are unable to pay for the surgery – that is where the AiRS Foundation steps in. The brewery will host an event in late September to kick-off the partnership, with 10% of the proceeds going to the AiRS Foundation. Plans are still being finalized, so be sure to follow Oak Highlands on social media (Facebook, Twitter) for the most up-to-date details. Find out where to purchase Oak Highlands Oktoberfest at: http://www.oakhighlandsbrewery.com/our-beer/where-to-buy/. For more information about the AiRS Foundation, visit http://airsfoundation.org/. Left: Shazam (credit: Intrinsic Smokehouse & Brewery). The arrival of August means it's time once again for IPA Day - the international celebration of the India Pale Ale. Last year, in honor of the occasion, I put together a piece entitled "Yesterday and today with North Texas IPAs," which discussed the past and present with regards to craft beer's most popular style. This time around, though, I'll put the spotlight solely on where things stand today, and how things have changed in the local IPA arena over the course of the last 12 months. To start, I'll go back to something I said in last year's article that still remains true. Nearly all North Texas brewing operations, whether they be new or well-established, have produced at least one IPA to this point. Holdouts from a year ago included 3 Nations, Armadillo Ale Works and Wild Acre, but as of the start of the summer, all three of those entities had entered the local IPA fray. Those aren't the only new IPAs on the market, though, since nearly every brewery that's opened in 2017 has 'hop'ped on the bandwagon as well (Denton County, Good Neighbor, Hemisphere, HopFusion, The Manhattan Project, Thirsty Bro). The biggest change in the local IPA landscape, however, has been the market introduction of IPAs with an East Coast influence. Originating at breweries like The Alchemist, Trillium and Tree House in New England, these cloudy beers feature bright tropical fruit notes, a fuller body and minimal bitterness. The haze and hop tones have led some to say they look and taste like juice, which has resulted in the term “juicy” becoming synonymous with New England Style IPAs (NEIPAs). Yet, many wonder if NEIPAs are really a style all their own. That is, as opposed to just being a hybrid of a single or double IPA. Naturally, opinions vary, but perhaps the best attempt to define the style (or at least lay down a foundation on which to build on) was offered by Gordon Strong in the May/June issue of Brew Your Own Magazine (click here to read the article). He's certainly the right man for the job, in light of his list of qualifications. In addition to being the technical editor and commercial calibration specialist for Zymurgy Magazine, Strong is also the president of the Beer Judge Certification Program (BJCP) and the principal author of the latest edition of the BJCP style guidelines. Of course, guidelines are just...well, guidelines, and if we've learned anything about the craft beer industry over the years, it's that style guidelines are open to interpretation. And, when it comes to NEIPAs, the story is no different in North Texas. Just consider the range of NEIPAs that have hit the local market in the past year. It's a given that they've all been hoppy (to varying degrees), but some have been malty, while others have been bone dry. Bitterness has been all over the map, with beers having anywhere from a somewhat thick to an ultra-thin body. What that says to me is, when Strong suggests that the NEIPA is an evolving style, he's not kidding. At least based on what has been served locally, what does or does not represent a NEIPA is still a matter of debate. In any case, judging by the style's popularity, it appears as if NEIPAs will continue to draw interest for some time to come. As for what there is to drink along these lines in North Texas, a list of NE-inspired IPAs is given below. Keep in mind that many, if not all, of these beers are released on a periodic basis with extremely limited availability. My advice? Find one...drink one...and see what your tastebuds think of this developing style. 3 Nations Brewing Co.: All the Pulp (brewed in collaboration with Turning Point Beer), White IPA (brewed in collaboration with Hop & Sting Brewing Co.). Chimera Brewing Co.: All Green Mink. Cobra Brewing Co.: Ho Lee Chit. Instrinsic Smokehouse & Brewery: Shazam, Texas Shake. Malai Kitchen: Cambodian Tiger, Jungle IPA. 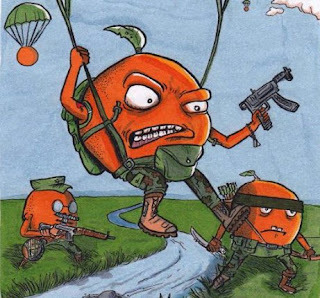 Noble Rey Brewing Co.: The Juice is Loose. Small Brewpub: Underdog IPA V2.0. The Manhattan Project Beer Co.: Half-Life. Great Raft Brewing: Grace and Grit. 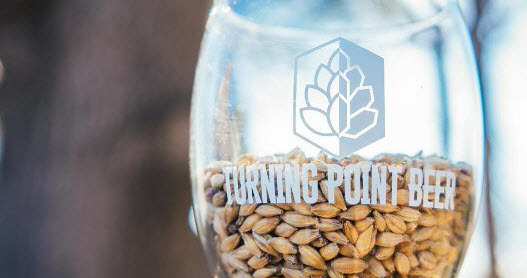 Brews from Turning Point Beer, Celestial Beerworks and Brutal Beerworks.